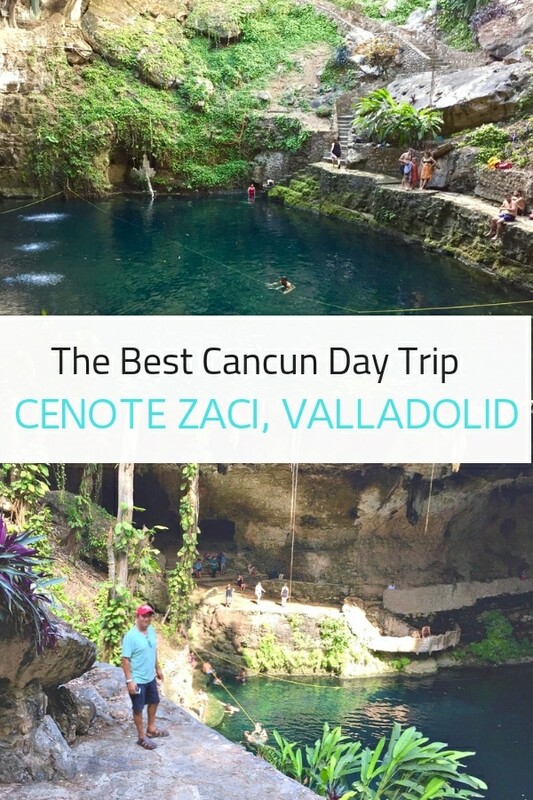 While food fans might be tempted to visit Valladolid Mexico solely to sample its deservedly famous longaniza (sausage), this colonial city near Cancun, Playa del Carmen and Tulum also happens to be home to Cenote Zaci, one of the biggest and most incredible cenotes on the Yucatan peninsula. 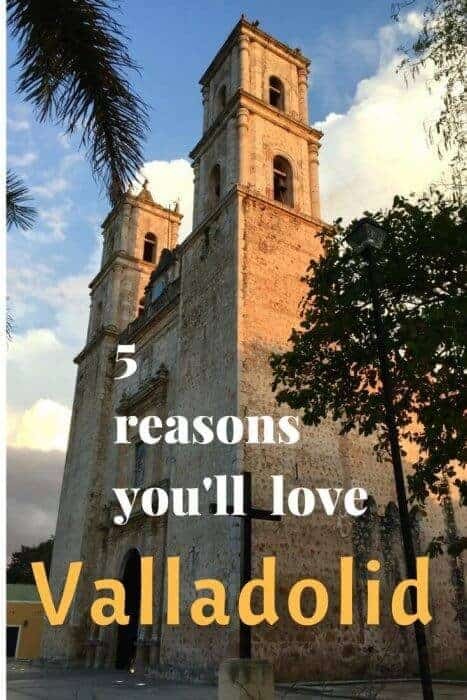 Valladolid is also rich in history, natural attractions and incredible Yucatecan cuisine, so here are the five reasons I think this small city might be one of Mexico’s best city to visit and why you too might fall in love with its many charms. The beautiful Cathedral of San Gervasio anchors the central square of Valladolid. Built on a built atop the original Maya town called Zaci, the city of Valladolid was founded by Don Francisco de Montejo in 1543 and as with many other colonial-era cities in Mexico, where the heart of the city centers around the zocolo or central park, Valladolid’s tidy Parque Francisco Canton Rosado is a beauty. Filled with leafy trees, towering palms and a gurgling fountain, it’s surrounded by gracious colonial style buildings. On the south side of the square is the Cathedral of San Gervasio, a beautiful church that seems to change colours from morning to dusk with the movement of the sun. 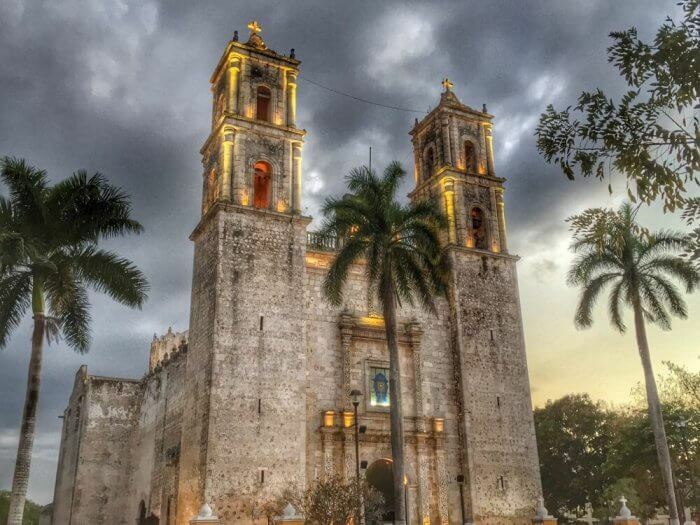 Known as the Mayan Pearl of the East, Valladolid is one of 111 Pueblos Magicos de Mexico, a designation recognizing towns of exceptional beauty, culture and character. Today’s population of around 50,000 people includes many indigenous Maya. Unlike other cities in Mexico where prices have risen due to an influx of foreigners, still under-the-radar Valladolid offers great value. For example, a quick search on hotelscombined.com unearthed a beautiful room at boutique-sized El Meson Del Marques (complete with a rooftop terrace and bicycles for guests) on Calle 39 for just $75 USD per night. Are you inclined to spend time in a fixer-upper of a country estate set in an orange grove? Expect to pay around $55,000 USD. Other intriguing options include a tiny house in the San Juan neighbourhood for $40,000 USD. One of the most appealing characteristics about buying real estate in the region around Valladolid is that unlike the Restricted Zones of Mexico (land within 100 km of Mexico’s international borders and land within 50 km of the coast), foreigners don’t need a bank trust to purchase property. Of course, you need to check this out with an expert first, but in the meantime you can browse the real estate listings on the Tierra Yucatan website and daydream about your own hacienda in the sun. If you’re more interested in renting, I spotted homes from as low as $600 a month. The only downside? Be forewarned that Valladolid can get very warm. The Average High Temperature ranges from 29 C to 34 C ( 84 F to 93 F) annually and although I did notice it cooled off considerably in the early evening, the climate is hot and humid. For us, when the sun reached its peak at midday, we’d hop in a taxi rather than walk and never paid more than 30 pesos (around 1.50 USD) for a ride. I can’t think of many cities that come with their own swimming holes. Although San Miguel de Allende offers thermal waters to bathe in (Read about them in the post Inspired by Colour in San Miguel de Allende), Valladolid offers something extra special when it comes to natural attractions. 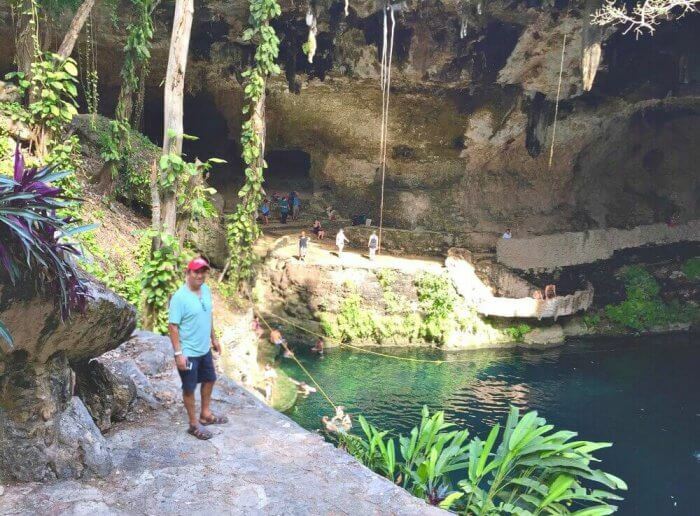 Not only is Valladolid surrounded by cenotes, still-wild jungle and historic ruins but just steps from the plaza is the jaw-dropping Cenote Zaci, one of the most beautiful natural wonders I’ve ever seen. This natural, water-filled sinkhole is reached via a slightly slippery path that passes under the gnarled roots of ficus trees, stalactites and vine tendrils, which makes it feel as though you are entering a mystic cavern. The entrance fee to Cenote Zaci costs 30 pesos per person but admission is free if you eat at Zaci Restaurant ( see below). So be sure to bring your bathing suit as you’re definitely going to want to take a swim in those turquoise waters. What is the depth of cenote zaci? While there is a sign that says no diving, the person on duty told me that the depth is unlimited. It is connected to other underground rivers and caverns so stretches across the entire Yucatan peninsula through a network of porous limestone rocks. That alone is incredible! 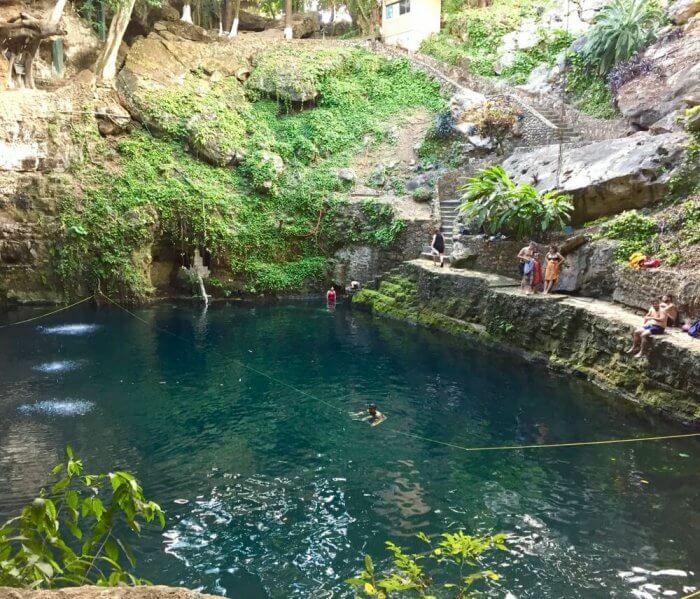 Note that the water conditions at Cenote Zaci can change daily. It’s a natural swimming hole so it’s subject to bird droppings, potential contamination from human pollution and dust. Unlike some cenotes that are completely closed, it’s open to the air. I enjoyed the openness as it didn’t have the claustrophobic feeling enclosed cenotes sometimes have. 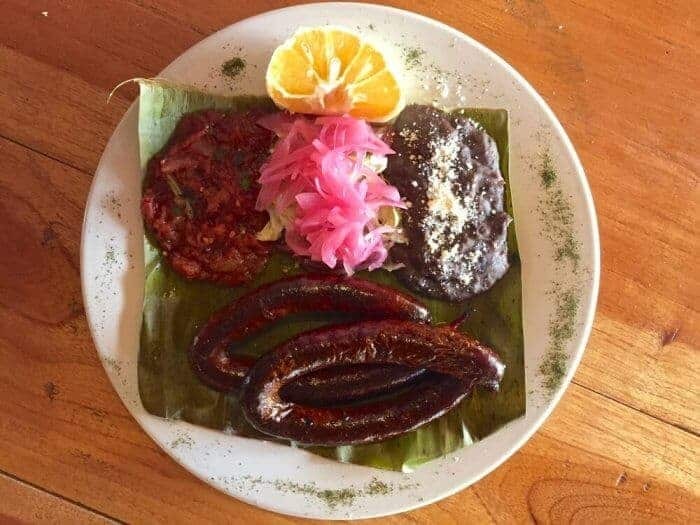 There’s plenty to choose from when it comes to restaurants in Valldolid – it’s one of Mexico’s best cities to visit for authentic Yucatan cuisine. The fact that Zaci, a breezy open-air restaurant next to Cenote Zaci, is popular with tour groups shouldn’t dissuade you from eating there. It’s got authentic local dishes such as lomitos de Valladolid, pork tenderloin in tomato sauce served with black beans, as well as Yucatecan specialties such as cochinita pibil, chicken or pork marinated in achiote, bitter orange and spices, wrapped in banana leaves and then baked in an underground pit known as a “pib”. You can also sample sopa de lima (lime soup) a delicious soup of shredded chicken garnished with lime and tortilla strips.There’s also the famous longaniza de Valladolid, a long, slim sausage similar to Spanish chorizo that’s most often served grilled accompanied by fresh handmade corn tortillas. Although the local cuisine sounds very meat-heavy, vegans and vegetarians will enjoy polcanes, an appetizer made of maize stuffed with chives, pumpkin seeds and white beans. There’s also Sikil P’ak, a nutty hummus-style dip made of pumpkin seeds, tomato and cilantro eaten with tortilla chips. The local squash also makes an appearance in delicious dips and side dishes. You’ll also swoon for chaya, a leafy vegetable similar to spinach that’s delicious in soup. As well, throughout Valladolid there’s also the opportunity to sample local spirits such as xtabentun (a delicious golden liqueur made of honey and anise), liquor de nance ( a small yellow fruit) and liquor de yerba buena (mint) as well as Mayapan, a spirit made of blue agave similar to tequila (it can’t officially be tequila as it’s not from Jalisco and the other specific regions), created at the distillery on the outskirts of Valladolid. For me, the world’s great cities also have great food markets. One of the things I love about Puerto Escondido, Oaxaca is the fantastic Benito Juarez Market with its towers of fresh fruit and vegetables, local cheeses and lively atmosphere especially on the weekends when the farmers bring their wares from their farms in the foothills and Puerto’s market sprawls out beyond its borders and onto the neighbouring streets. 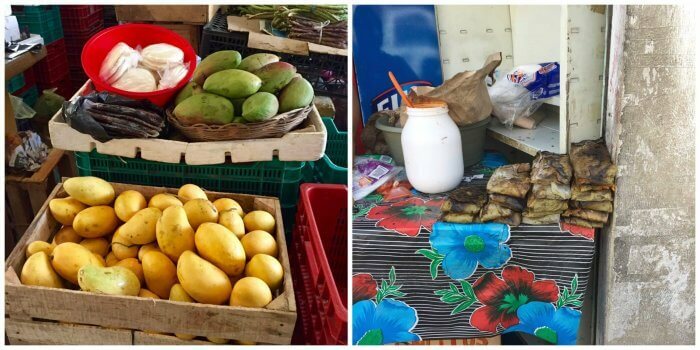 Valladolid’s Mercado Municipal is bursting with local fruit such as mangos, mandarins, sapotes and more. Any city that makes an effort to welcome pedestrians and cyclists deserves recognition in my books. 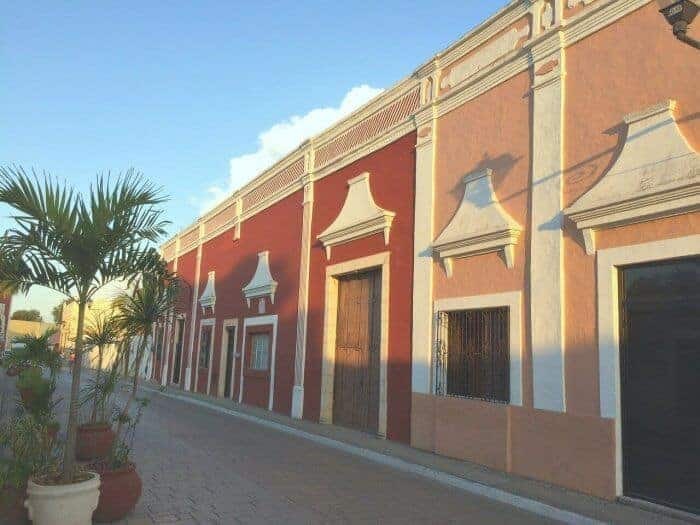 Valladolid has made an effort to enhance the livability of its historic quarter by preserving the architecture of streets such as the Road of the Friars or Calzada de los Frailes (Calle 41A) lined with colonial homes with almost Moorish architecture. This atmospheric street, offering a fine collection of cafes, bars and shops selling artisanal crafts, begins at Calle 46 and Calle 41 and ends at the park in front of the ex-convent San Bernardino de Sienais located within the Sisal neighbourhood. Plan to spend a few hours at least at this 15th century former convent and church. 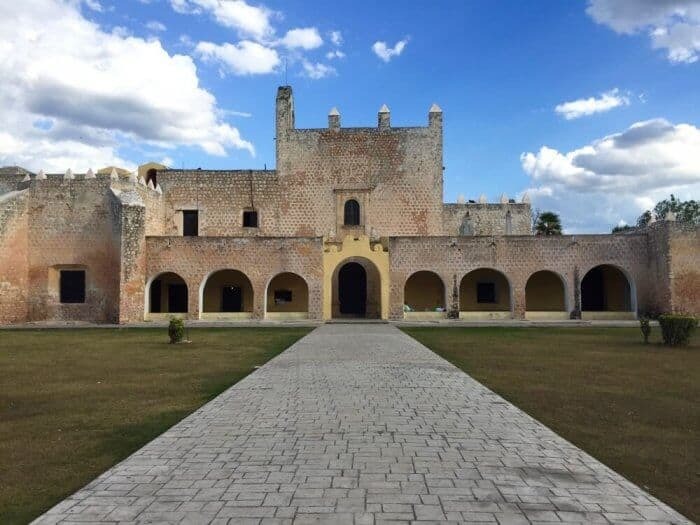 Built in 1542 and completed in 1560, the Sisal monastery was the only Franciscan structure in the Yucatan to have served as a Mayan mission at the same time. Its expansive grounds make for an interesting afternoon of explorations. Highlights include the Waterwheel ( dating to 1613) of Cenote Sis-Ha where muskets, spears and other weapons from the Caste War were discovered within its depths. Valladolid Mexico was the site of two significant events, the Caste War of 1847 and the beginning of the Mexican Revolution in 1847. During the high season, a video spectacle titled the Nights of the Heroic Valladolid — a representation of the Caste War and the seeds of the Mexican Revolution — is projected on the building’s historic walls at 9 p.m. each evening. 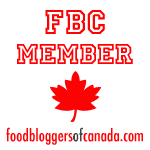 Later, be sure to stop and eat at the Taberna de los Frailes. 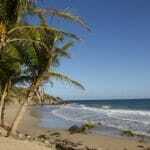 Getting There: Valladolid is located midway between Merida and Cancun, about two hours from each. It’s an easy day trip from Cancun or a stop on your way to visit ruins such as Chichen Itza in the Yucatan. You can easily catch the ADO bus to Valladolid Mexico from Merida, Playa del Carmen, Cancun or Tulum. In Playa del Carmen, the buses depart from the Terminal de Autobuses ADO Playa del Carmen Alterna located on 20 Avenida Norte near Walmart and the Municipal Plaza. 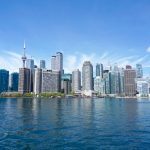 If you purchase your ticket several weeks in advance you can save up 40% off the price of your ticket and avoid getting a seat at the back of the bus near the washroom. Yucatan Tourism: You can also get information for planning a trip on official Yucatan Travel and Mundo Maya Yucatan travel websites. 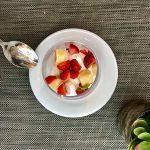 Valladolid Restaurants: Dining highlights include a wealth of regional specialties at Taberna de los Frailes, Zaci restaurant at the cenote as well as Las Campanas. Entrance Fee for Cenote Zaci: Entrance to Cenote Zaci costs 30 pesos but is free if you order food or drink at Zaci restaurant. When you arrive at the site instead of going right directly to the cenote, veer left and enter the restaurant. Inside the restaurant there is a gate to enter the cenote. Don’t wear sunscreen when swimming in Cenote Zaci as the chemicals can be harmful to the environment. When you’re finished swimming, you may need insect repellant if you’re planning to spend time sitting in the restaurant. Valladolid Hotels: Check out boutique-sized El Meson Del Marques (complete with a rooftop terrace and bicycles for guests) on Calle 39 or the just-opened Hotel Casa Margarita, which comes with an outdoor swimming pool and is centrally located on Calle 38. I haven’t bee to Mexico in years, so lately I’ve been compiling a list of all the places I want to see. It’s pretty extensive, but until now I did not have Valladolid on it. It looks like the perfect place to spend some serious time. Although, I’m not so sure about buying a house. I’ll just rent. Valladolid looks like the kind of city I’d love to spend time in, with its history, architecture, people-friendly streets and food. The heat would particularly appeal to my husband. Just when I think I really know a country, I discover something new! Thx so much for this post about Valladoid, Michele. Not only have I not been there, I’ve not even heard of it before! But your post definitely makes me want to go and I am bookmarking and pinning your post for future reference. Thx! Have never heard of it before but Valladolid looks like a great city. Have not made it to that part of Mexico so will make sure I visit when I do. I have to admit I had never heard of Valladolid until I read this post. Thank you for teaching something 🙂 The architecture looks amazing and the cenote looks like a great place for a dip. When we travel we definitely seek out food and drink and xtabentun sounds like something delicious I would love to try. Valladolid is a truly beautiful city. It is indeed a revelation. The church looks both majestic and serene. It would be a great experience to saunter leisurely around the place and drink in its endearing charm. Valladolid looks nothing short of wonderful. We have a trip to Cancun planned for next year with a few days spare. Valladolid is also a convenient base to visit Chichen Itza, with affordable accommodation & food, and as you mentioned there are some beautiful cenotes around. I had a great stay in 2016!